There are a few different types of Facebook job advertisements that you will encounter through social recruiting, such as Classic Ads and Sponsored Stories or Posts. A Classic Facebook Ad is the kind of ad you see on the right hand side of your screen when you visit the Facebook homepage from a desktop computer. These are “classic” because they’re the original Facebook ads, and they are positioned to users as advertisements. A Sponsored Story or Post shows up in a user’s Newsfeed on both mobile devices and desktop computers. 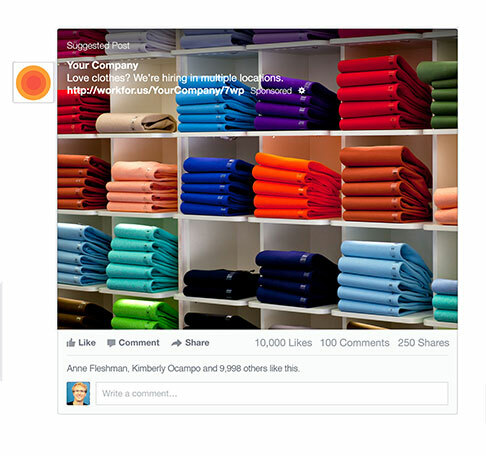 A Sponsored Story is positioned as a recommended post or page that a friend has liked. A Sponsored Post is positioned as a recommendation of a post or page that a user might like based on his or her interests. The benefit of using Facebook Ads, no matter what type you choose, is the ability to target them toward your ideal candidates. If you’ve ever taken even a cursory glance at the ads on your personal Facebook page, you’ve probably noticed that the majority seemed highly relevant to your own interests, location, work history, and more. That’s because Facebook Ads give marketers (and now recruiters!) the ability to target based on specific criteria. 1. Custom Audiences: Chances are you already have a talent pool outside of Facebook. Perhaps it’s an email list from your ATS or a recruiting event. If you want to reconnect with those potential candidates and drive them to your Facebook Career Site, you can turn your lists into “Custom Audiences” that can be targeted with Facebook ads. Think of Custom Audiences as a way to take email marketing to the next level: by allowing you to reconnect with members of your list on their favorite social network. 2. Lookalike Audiences: Maybe you don’t have a list (or want to grow your talent pool even bigger), but you do know what kind of candidate profiles you want to target. Lookalike Audiences let you build a database of ideal candidates by comparing Facebook profiles similar to an existing list of candidates (or even current employees) in order to target the candidates you really want. 3. Partner Categories: This most recent update to Facebook’s advertising options is one of the most exciting for those looking to target based on more than simple profile data like location, work and education history, or “liked” brands or companies. Without ever revealing a user’s private data, Partner Categories help you hone in on specific groups of people based on occupation, purchase history, , lifestyle, and more. This brand new feature promises to give talent acquisition and employer branding professionals like yourself even better control of the way you target and attract talent. 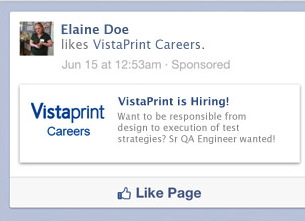 Facebook Ads platform that it’s time to show the user an ad for your careers. This is especially useful for increasing candidate conversion rates and keeping your talent pool strong. Facebook Ads give you many options for targeting–these are just some of the newest. If you’re interested in learning more about ads, you can download the Work4 data sheet here. Have you had any experiences with using Facebook Ads for recruiting? Tell us all about it in the comments below!